Is it already the beginning of April? How time flies. 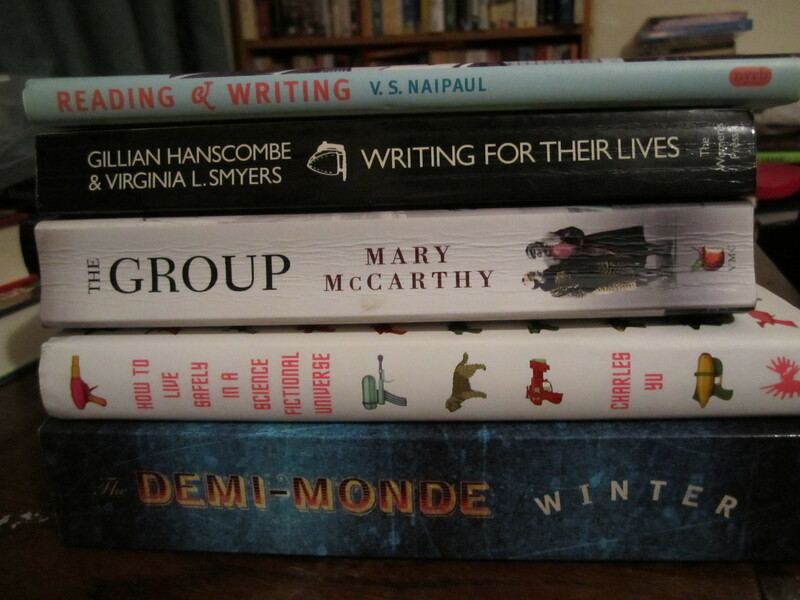 And what a lot of books I’ve got my mitts on this past month. I’m almost embarrassed to share. Almost. Because I know how much y’all love lists of books, heh. Reading and Writing by V.S. Naipaul – this is for my father who is a fan of Naipaul’s work. Of course I’ll try and read it before I hand it over to him. Buyer’s prerogative! Writing for Their Lives: The Modernist Women 1910-1940 by Gillian Hanscombe and Virginia L. Smyers – A title by The Women’s Press. I haven’t really heard of the writers discussed (Dorothy Richardso, HD, Djuna Barnes, Marianne Moore and Mina Loy) so it should be interesting. Besides, I can’t really pass by books on women writers. The Group by Mary McCarthy – need I say more? I’ve been looking for this book for ages and it just fell into my hands! How to Live Safely in a Science Fictional Universe by Charles Yu – I’ve been wanting to read this for ages too. It’s had some amazing reviews. The Demi-Monde: Winter by Rod Rees – such a beautiful cover and with some interesting reception. A virtual world governed by some of the world’s most monstrous figures. Intriguing. The Tapestry of Love by Rosy Thornton – has had some wonderful reviews. Marie-Thérèse by Susan Nagel – about Marie Antoinette’s daughter. I’ve always wondered what had happened to her. 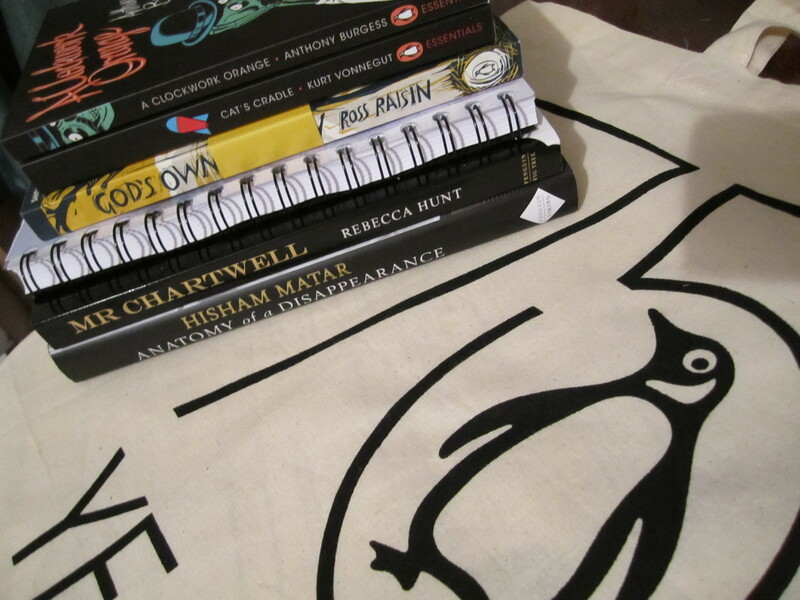 I won this in a competition held by Bloomsbury Books. The Good Muslim by Tahmima Anam – I LOVED her debut novel A Golden Age and cannot wait to read this. Kindly sent to me by Canongate Books. Chinaman by Shehan Karunatilaka – I recently read a short story by him which was brilliant and am looking forward to reading this one. Selected as one of the Waterstone’s 11. Kindly sent to me by Jonathan Cape. 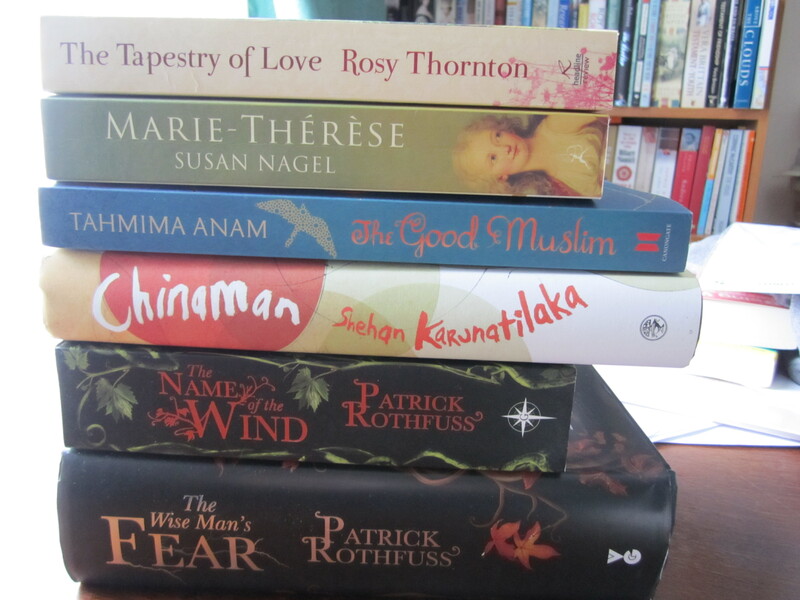 The Name of the Wind and The Wise Man’s Fear by Patrick Rothfuss – I won these in a competition. And The Wise Man’s Fear is SIGNED. Woohoo. Thank you Orion Books! A Red Herring Without Mustard by Alan Bradley – the third in the delicious Flavia de Luce series. Love, love, love them. Kindly sent to me by Orion Books. The Journey Home by Dermot Bolger – chosen by Reading Matters for my book club. Occupied City by David Peace – I read Tokyo Year Zero several years back and was very impressed by the gritty and realistic portrayal of Japan after WWII even if at times I found it very uncomfortable reading. The 2nd in the series. Bryant and May Off The Rails by Christopher Fowler – I’m a HUGE fan of Bryant and May. Fowler’s knowledge of London is exceptional and I lurve his books. A Clockwork Orange by Anthony Burgess – I’ve only watched bits of the film but haven’t read the book. Cat’s Cradle by Kurt Vonnegut – I’ve heard so much about Vonnegut but have yet to read anything by him so I thought this would be a good place to start. God’s Own Country by Ross Raisin – he gave a wonderful introduction to his new novel Waterline. I’ve heard lots of good things about this one. Landfall by Helen Gordon – a debut novel about an art critic and a teenager. Mr. Chartwell by Rebecca Hunt – about Churchill’s ‘black dog’ in the flesh. Intriguing. Anatomy of a Disappearance by Hisham Matar – lovely writing from the excerpt I heard. 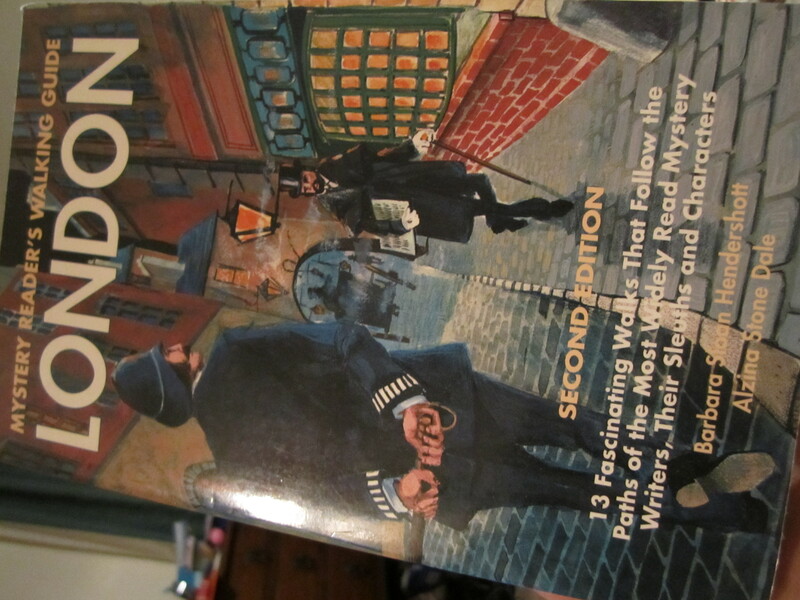 Mystery Reader’s Walking Guide: London by Barbara Sloan Hendershott and Alzina Stone Dale – I squealed with delight when I got this. Mysteries plus London. And there’s a bibliography too. Never…NEVER… be embarassed of your mammoth book hauls, Sakura. We applaud you!!! Bravo!!!! 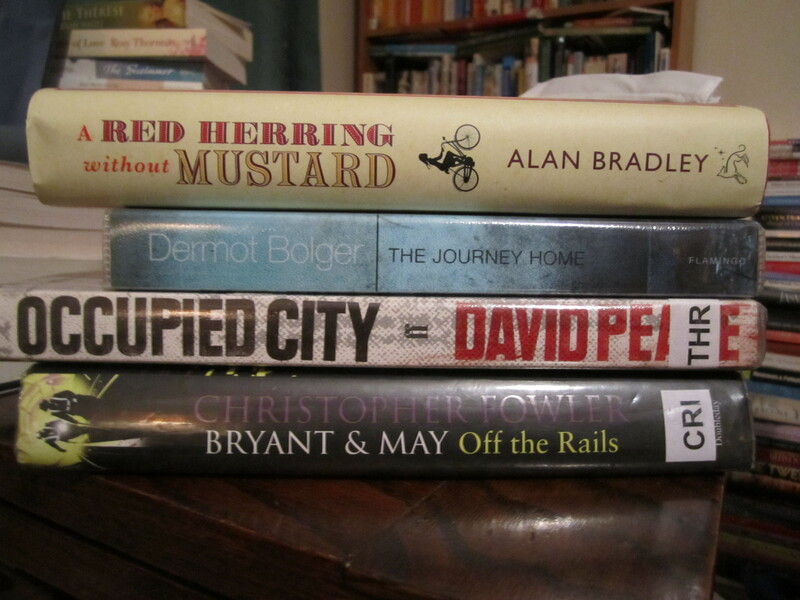 What a lovely stack of books! I think I have to check out Demi-Monde, and must start reading Christopher Fowler. Oh my! So many books on your stack are ones that I covet. Love the Murakami (at least aesthetically… I haven’t actually read that one!) and I’m so curious about the Charles Yu. I hope you enjoy all your loot! I see you’ve got Vonnegut in your stack. If you don’t know about the women writers in Writing for Their Lives you’re in for a treat. Look for Djuna Barnes’ Nightwood – you’ll never forget it. HD is poetry – really beautiful modernist poetry as is Marianne Moore. Thanks for the very supportive comments people! It’s good to know I’m amongst friends who understand! I started Red Herring this morning. Everyone says it’s an improvement on The Weed, which I found a little disappointing. I haunt charity shops here looking for good books, but the pickings are slim. You guys are lucky to have Oxfam, which seem to have quality stock! Oh my goodness, what an enormous pile of loot! I envy you!! 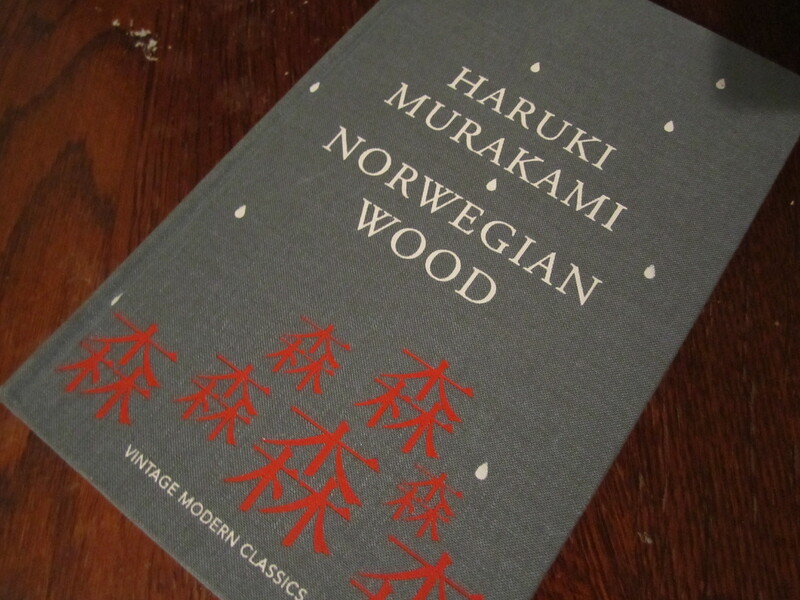 🙂 I especially covet your special edition of Norwegian Wood. And I’ve added Naipaul to my reading list, seems like an author I should read at least once. It all about the limited editions these day, isn’t it?